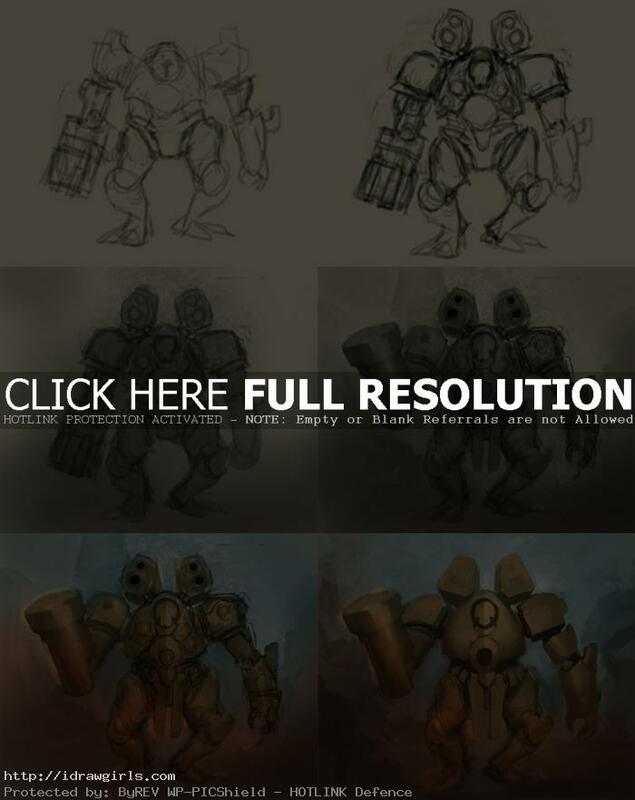 How to draw and paint Mecha concept art. 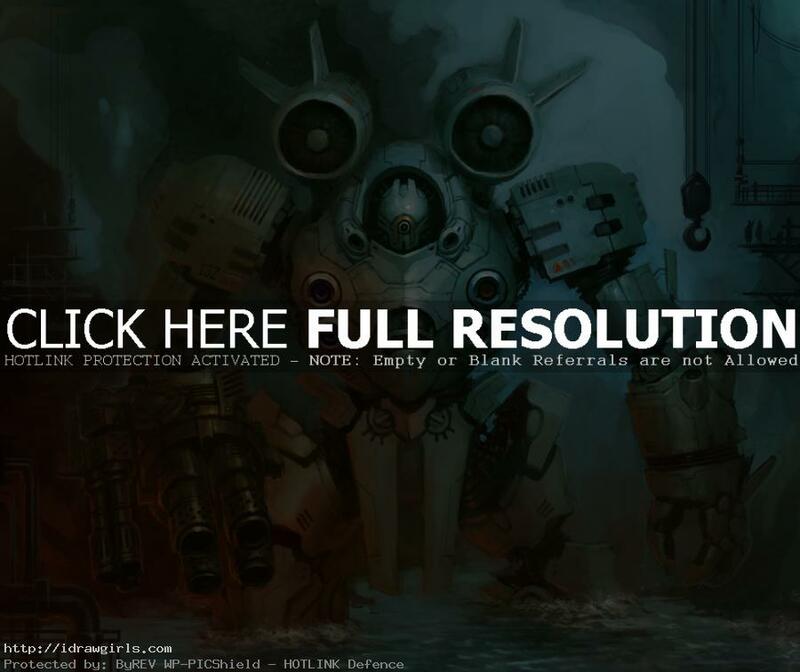 You will learn how to paint basic Mecha design from this video tutorial. Since I haven’t really done any Mech concept sketch in a while. I think it’s about time. Since most of the earlier stuff on the blog are really quick and rough sketch. Like most of the previous video tutorials, this one is a bit old. 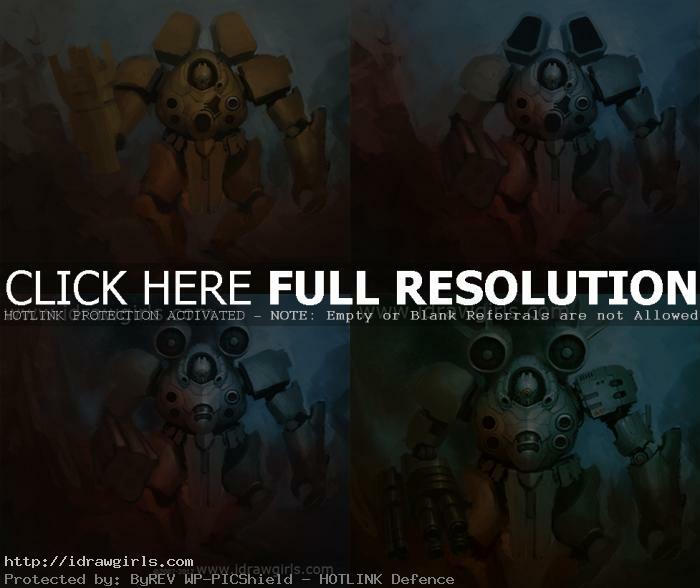 Click the labelled button below the video to watch the most recent Mecha painting video tutorial. You can scroll down further to see step by step tutorial. This time I decide to give it a little more time to make it more refine concept to it. But it will take a while. So here are step by step I start from initial sketch idea. I try as much as I can to finish it up this weekend but unfortunately…I can only find a few hours to play with it. I amped up the Machine gun, changed and tweak the design a little bit on the bottome half. It’s been a really fun session creating mech since I haven’t really done a full launched Mecha in a long while. A few more painted session then I think I will call it done. ART tips: Talent is often overrated, and often deceive you. Whether you have it or not, forget that it’s there. Practice, practice, and practice is only one sure way I know will make me the better artist. As for the pose, it’s very generic since most conceptual intend is to be able to see or expose visually it’s appearance. Maybe in a later ones, I will try to do more of a cinematic composition or visual story panel style…so that they will be more action and interesting pose. Step 2, Flesh your thumbnail out a bit. From the very sketchy thumbnail composition last time, now I am going to the stage of what we usually called under-painting. At this stage, I am just focusing on the BIG shapes or the big elements of the Mech Concept’s geometry form (forget the tiny bitty little detail for now). Focus on the main shape of the object and the direction of the light. And if there is under lighting, look out for that too. As for this image, I am shooting for finished shiny yellow color coat over metal, similar to somewhat like a yellow sport car or something of that sort. But nothing is set in stone at this point, since now I have to overall shape paint…I can still tweak the material or some of the pose if I need to (thanks to digital painting). **I’m still not sure about the machine gun hand direction. The way it’s position is more like a soldier holding an machine gun rather than the actual Mecha would hold it’s own machine gun hand. Note on the update: I decided yellow probably isn’t going to work in this design because I want a little more dramatic lighting effect for this particular drawing, painting, color concept design. So I will have to go with the off-white color (white to light gray). White would probably look slicker anyway in this particular design (kinda remind us of big airplane and such). I will have to change it from yellow to gray or something similar. You can use this tool to change and tweak your lighting however you like them to be. Good rule to go by is…Cool light warm shadow vs Warm light cool shadow (Tips here -Color temperature warm vs cool for artist). So I adjust Midtone then Highlight and Shadows until I get the yellow to change to off white color. Because I want to make underlight more dramatic that why I choose to go with the new color for the Mecha robot. -Then, I decide to add the pilot cockpit onto its mid-section, figure it would make sense and it would definitely show the scale of the robot that we (human) can related to. Thank you very much for this Sir ! this is really amazing you should be proud of yourself. couple of question though. you add black and white paint to set the tone of your art piece. do you use the multiply layer? when you apply the colours, do you do that on a separate layer? also do you use overlay when you apply the colour? or do you use a normal layer to apply the colours?